Whenever you are grooming or saddling, you will need to tie your horse. Horses and ponies can be tied with a lead rope, trailer ties, or cross ties. No matter what is used, tying must be done in a manner that is safest for handler and horse. There is some debate whether horses should or shouldn’t be tied ‘solid’. Tying solid means to tie so that it’s almost impossible for the horse to break free. For the horse’s or pony’s sake, it is probably best if handlers don’t tie solid. 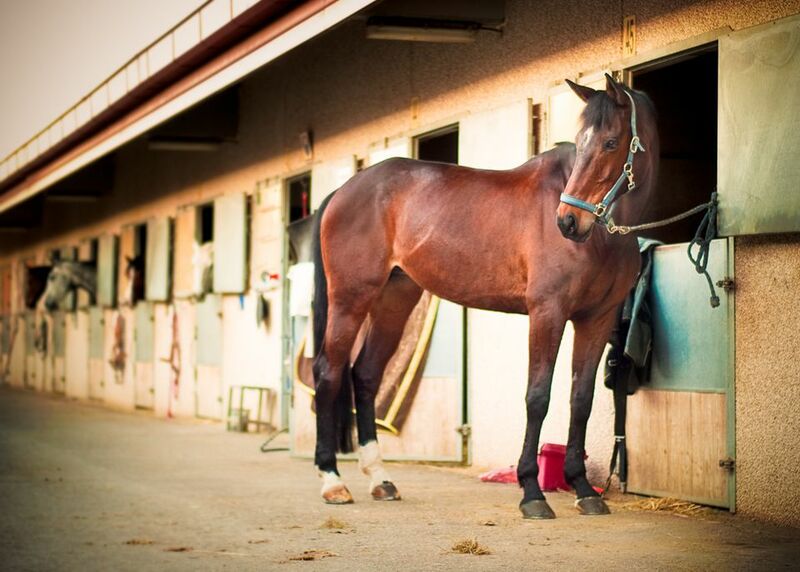 If a horse is badly startled while tied it could panic, struggle, and injure its neck and back. The goal should be to teach your horse not to be tied but to stand. A horse that is taught to stand won't challenge the ropes it is tied with. Sometimes, you have to balance horse safety against people safety. There may be situations where it is safer to tie solid than have a badly frightened horse break away and bolt into a crowd of people or busy highway. When we are working with our horses in a paddock or in the stable, it’s safer for the horse to be tied so the rope or tie will break free if it panics. Ideally, the rope should be attached chest height or higher. The rope should be tied so it doesn’t dangle low enough to be stepped over but not be so high or so tight that the horse’s head is restricted. Never tie to a bridle, with the reins, or to the bit in any way. If the horse struggles, it could severely injure its mouth. Always tie to a post, wall, or partition that is firmly anchored and will not come loose if the horse pulls on it. The object is to have the tie rope break rather than the structure you are tying to or the horse’s neck. Don’t tie your horse or pony to anything that moves. If you are at a horse show or trail ride, be cautious when tying to fences. Old posts can be weak at the bottom and may be ripped up by your horse. anything else that isn’t securely anchored. In a barn with roomy workspaces or aisles, cross ties secure your horse and make it easy to work all the way around when grooming, or tacking up. Cross ties should be long enough for the horse to lower its head comfortably, but not so long that it would be possible for the horse to become entangled or even step over the rope. Cross ties can be made to break free easily by attaching the ends through loops of bailer twine or strong string. A ½ inch garment elastic can be used if you like the idea of a tie that flexes when the horse pulls on it a bit, but will still break if the horse struggles. Chains are not a great idea for cross ties. If a panicking horse breaks free with chains attached, the chains can swing and cause injury to both horse and handler. Trailer ties work well if you are tying in or to a trailer/post. Make sure your trailer ties are long enough so that your horse’s head is not too restricted. Some ties are made 18” long, and not long enough for use while you are working with your horse; your horse won’t be able to move his head naturally. Longer, adjustable trailer ties (about 3 feet long) with quick release snaps are ideal. Make sure the snaps aren’t stiff with rust or winter ice so in an emergency they work the way they are supposed to. A cotton rope, 1 inch to 1 ½ inches in diameter, is ideal for lead ropes. Flat lead shanks of leather or webbing aren’t ideal for tying with. Again, loops of bailer twine, string, or garment elastic make safe breakaway ties around a fence post. Tie high enough that the horse cannot step over the rope, but not so high or tight as to restrict the movement of the horse’s head. Check your ropes often for wear if you need to tie solid, such as out on the trail or at a horse show. Use a quick release knot so that if your horse is struggling, you can easily pull on the end of the rope and free the horse.